The return of Gervase Frant, Earl St. Erth, to his ancestral home of Stanyon Castle following the death of his father should, by all events, be a time for celebration. But he finds his step-mother and younger step-brother quite disappointed that he has managed to survive his war service and openly resentful of his claim to the estate. His cousin Theo, the only welcoming family member, steers him through this less than happy homecoming – but when a series of cruel “accidents” begin to plague him, the question becomes – who would benefit the most by the untimely death of the new Earl? The Quiet Gentleman is a different sort of Heyer – our Hero is soft-spoken, fair-haired, delicate, almost feminine in his address, “nothing but a curst dandy”, but his family and the reader soon learn that “his apparent fragility and gentleness were alike deceptive” – he might be kind and generous but “was not easily to be intimidated.” Our pseudo-heroine, Marianne Bolderwood [reminding us of another overly romantic “Marianne _____wood”] has her requisite fall from her horse, is stunningly beautiful, young and innocent awaiting her come-out, and has everyone at her feet, including the three men of Stanyon. Enter Miss Drusilla Morville, the visiting companion to the Dowager step-mother and a very un-Heyerish female: she is “not a beauty” as we are continually reminded. Indeed, the Hero rules her as not having “a pleasing enough countenance or conversation.” And, she has “peculiar parents” – liberal feminists, her father a “Pantisocrat” cohort of Coleridge and Southey, her mother a raving writer of novels in the line of Wollstonecraft. She appears at first as only a bystander, barely attending, very practical and helpful, accomplished it seems in nearly everything: household management, medicine, horsemanship, the pianoforte, dance [the WALTZ! ], fashionable, and unflappable, yet lacking “sensibility” and a romantic imagination [“not in her nature to go into raptures”!]. We learn nothing of her inner thoughts until more than three-quarters through the book, where she has one of the more amusing dialogues with herself that I can recall ever seeing in print! Subordinate Characters? The Domineering Dowager, a carbon copy of Lady Catherine de Bourgh, controls all conversation, overindulges her son, and appears “formidably attired in purple grosgrain and velvet, wearing the famous Frant diamonds …. all of which would have been the better for cleaning…” [sounds like an Austen letter! ]; Martin, her son, hot-tempered and moody, though quite humorous when not in one of his dark sullens; the visiting Viscount, friend to the Earl, who suspects foul doings; and as always in Heyer, the various servants and bit players, an all-star cast, who add interest, much humor, and foils to the main characters and have great names like Chard and Leek. The expected Heyer is all present: the fashion of the men in their Weston duds, snuff boxes, various neckcloths, Hessians, pantaloons, and quizzing glasses; the women in their gowns and ribbons and laces and hairdos; the historical settings and literary allusions with facts seamlessly woven into the narrative; the social life and customs – hunting, horses and carriages, fencing [Heyer must have taken lessons! ], and The Balls; and a treat here is the well-described Castle with its winding cavernous passages and hidden secrets complete with a scene right out of Northanger Abbey; and of course, that Heyer wit, albeit less lively, with cant expressions only occasionally peppering the talk, but full of sharp-tongued social commentary, and thankfully Miss Morville’s placid prosaic comments on everything quite saving the day. I found too often an odd transition from one paragraph to another – disjointed really, and the conversation oftentimes seemed quite silly, Heyer perhaps not quite sure of her direction? – but I began to see the whole narrative as a set-piece, nearly an Agatha Christie mystery play coupled with a rollicking comedy of errors, with so many characters entering and exiting, one of whom will prove to be out for murder. It is a mystery of course, of which I shall not speak, so as not to ruin the fun. Do I dare say that I figured it out by page 15, but that it doesn’t matter? And Romance? – this is not the passionate dagger-drawing sword-play Heyer – here we have a highly intelligent Hero and Heroine that find the Truth about each other as they work their way through a Dangerous Game where life is at stake. But it is Drusilla, certainly one of the most interesting, engaging and “very remarkable” of all Heyer’s Heroines, who unromantic as she may be is really the precursor of Renee Zellweger wherein the Hero “had her at ‘hello’” – but this tale unique in its outcome being far from clear until the very, very end. A Masterpiece Mystery production would suit! And I have the cast nearly all figured out…. Deb Barnum, author of the Jane Austen in Vermont blog, had a former career as a law librarian, then followed her heart and bought an antiquarian book shop, certainly every book lover’s dream – [she could write her own page-turning tell-all!] – but alas! hating being tied down to retail, she closed the bricks & mortar shop and now runs an internet-only business – Bygone Books – though she does miss the customers and the daily opportunity for book chat! A reader of Jane Austen in her early years, she began a re-entry into Austenland too many years ago to mention when her daughter was reading Emma in college, and she has not looked back – she is the Regional Coordinator for the new JASNA-Vermont Region, is an avid collector of books on London, Regency England and of course Jane Austen. She only started reading Georgette Heyer last year, beginning with Faro’s Daughter [still her favorite] and is speedily working her way through them all, loving her wit and her right-on depictions of all things Regency – and is just loving this immersion in the late 18th-early 19th century England… You can follow Deb on Twitter as austeninvermont. Enter a chance to win one copy of The Quiet Gentleman, by Georgette Heyer (Harlequin , 2009) by leaving a comment stating what intrigues you about the plot or characters, or if you have read it, which is your favorite character or scene by midnight Pacific time, Monday, September 6th, 2010. Winners will be announced on Tuesday, September 7th, 2010. Shipment to continental US and Canadian addresses only. Good luck! I’d like to read about our hero’s return and the darkness he met until he was quatinated with love. It’s interesting how closely several parts relate so much to Jane Austen. I’d love to read this novel myself and draw these relations and similarities and then appreciate this Heyer for it being enjoyable. I’m always a little disappointed by The Quiet Gentleman. The plotting and transitions seem much more laboured than with most of her works, making for a tiresome read. Hi Claire – yes, I agree with you – the disjointedness I mention ruins the usual flow one expects from Heyer – this work was less popular with her fans when it was published – after ‘The Grand Sophy’, a tough act to follow! But I found other things to appreciate in this work after letting go of those expectations and came away with a better appreciation of Heyer – sort of like Austen’s Northanger Abbey that too often gets short shift and needs re-reading, and another re-reading to see all that is there! Thanks for commenting – maybe we would both enjoy the movie more! This one sounds like a very different kind of Heyer – a quiet hero, and a less-than-beautiful heroine. And, as if that is not enough to attract one to the novel, a large and interesting supporting cast. That is always interesting! I’ve always loved this one just because of its differences to Heyer’s ‘usual’ novels. The hero and heroine are so atypical that I loved them all the more for it. Let’s face it, they are actually more typical of real life than the normal heros and heroines. Being a ‘sensible’ sort myself, I’ve always had a soft spot for Drusilla – now if only I could find my ‘Gervase’! Yes Carol, exactly so! Drusilla is delightful isn’t she?! Not sure how many “Gervases” there are out there – handsome and intelligent and wealthy, with a Castle to call home! – but worth the hunt I am sure! Sounds like another great Heyer. I’m looking forward to reading it! What a thoughtful review, which has intrigued me about the book. I would love to read another rollicking comedy of errors but will be prepared about the transitioning and see if I can value the hidden literary art. I am new to Heyer, I just read The Foundling, but I am enjoying the day-by-day summaries of her books. This one sounds interesting because of the not so typical heroine. Thanks for a great month. This was never one of my favorites, but like most Heyer novels, was still a joy to read. I absolutely loved Drusilla’s conversation with herself, and her character in general. But this book didn’t make that much on an impact on me, so I can’t recall much else. I’ll have to reread it soon! Oh, I love quiet heroes who are steel underneath. Secret identity! Superman! I haven’t read THE QUIET GENTLEMAN, but I’m sure I’ll enjoy it. The 1st time I read this one, I wasn’t really impressed, until I got to the conversation Drusilla has with Gervase about her parents and their friends. That hooked me. Then when I read it again years later, I got caught in the very first scene, with the discussion of the Frant ring. The part about the epergne is another favorite. This one may not “sparkle”, but it still has a lot of gleam! This is one of my favorite Heyers. Drusilla is a wonderful heroine, and I like both the mystery and the wit of the novel. The Dowager and her pronouncements, the scene over the epergne, Drusilla’s father – I could go on. This is a novel I reread frequently. This sounds interesting. I love the name :-) Really, really great review. I remember reading this and being appalled at the family Gervase came back to being upset with him for not having died in the war. If I remember correctly, he puts up with a lot of nonsense from them that had me wanting to boot them out. I enjoyed the book and recommend it, too. Although I didn’t at all like the “mystery” aspects of this story – the culprit just seems too entirely unlikely (by which I mean that for the exact reasons that we don’t suspect him, his is in fact unlikely to be the bad guy) – I do love Drusill and Gervase. Their romance is one of the best in GH. Drusilla is my favourite character. I agree with AprilFool: I’ve always liked “The Quiet Gentleman” because of Drusilla — I can really relate to her — and I like Gervase very much, too. So, I’ll bite: which actress and actor do you have in mind for Drusilla and Gervase? I read The Quiet Gentleman too long ago to remember more than the fact that it was one that I liked, but not a favourite. I would love to win a copy as I don’t have one of my own. 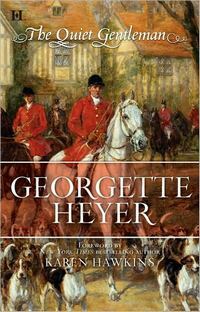 Georgette Heyer’s heroes and heroines are very varied – from the more sensible and in-charge lady to the young girl who lacks confidence, and from the very alpha male to the metrosexual almost-modern guy. And I like it that her stories always have just the right hero and heroine! I look forward to re-reading this one again! I love your honest review on what you did and did not like about The Quiet Gentleman. I am intrigued by your description of Drusilla. She sounds like a unique heroine that I would love to read about! I loved Drusilla, as she is someone I can relate to – practical and sensible given to no drama. She has a very droll sense of humor that hero manages to discover, inspite of his earlier assumptions about her “mousy” character. Gervase, the hero is also very lovable – gentle, patient and always kind to everybody inspite of his rank. The plot was interesting enough to keep me hooked till the very end. I thought this book had more heart to heart hero-heroine conversation at the end than most Heyer romances. Very delightful book, all in all. Love everyone’s comments! – hard to choose what to include in a review without giving too much away, and doubly difficult that it is a mystery – there are many more Austen echoes – her bio says she was re-reading Austen while writing this book; and the very humorous scenes – as mentioned by Terri and LizM, the epergne [i.e. an elaborate centerpiece for a table], which first alerts Gervase to Drusilla’s management abilities, and conversations between her parents are hysterical – one of my favorite lines is from Druscilla’s mother when she sets aside her feminist views exclaiming “don’t confuse theory with practice!” – I nearly fell out of bed reading that line! The new heir, an old castle, questionable relations, questionable accidents, a heroine not of the norm how can one not to be intrigued. I am going to have a great time when I finally get to read her works. I like the mystery here, as well as the comparison to Agatha Christie. I want to know who is behind the “accidents” and why his family is so unwelcoming. The romance is almost secondary. Of course it interests me, but… well, I just want to get the mystery figured out! I’ve not yet read The Quiet Gentleman but a returning hero with a disgruntled family who would like to inherit his wealth sounds like a great set up for a mystery. This is one of the less ‘bright and sparkling’ but still a good reading because of its being atypical. In real life, most of us are more like Drusilla than Sophy for example. As has been said, this is more a mystery than a romance, but it also provides with an idea that will be given a twist in another novel – the unwanted heir arrives to a family reunion. That will be The Unknown Ajax. Yes, Cynthia – thank you for bringing up The Unknown Ajax – I have not read it but it is my current “listening read” – and it is wonderful – ALL those family machinations, and the “Hero / heir” so very unwanted by everyone – not sure where this story is headed, but enjoying the journey I assure you – the reader is Daniel Philpott and he is a master of voices – this northern Hero sounding so like Richard Armitage’s velvety tones, I was sure it must be him! This is one book that I’ve been wanting to read for a while. Your review makes it sound more intriguing. Interesting, how Heyer seemed to vacillate between her usual “light and bright and sparkling” fare, and somewhat moodier reads such as this, which feature her usual wit and romance but lack the levity of the others. Maybe “lack” is the wrong word: it makes it sound as though these books are inferior, when really they needn’t be. I will definitely be reading this one, but I think I’m going to allow myself to get further acquainted with the more traditional Heyer novels before exploring her divergences from the usual. Hmmm.. I’ve read all of Heyer’s books, but remember very little of this one. I’m interested in reading it again, since the comparison to an Agatha Christie set piece sounds like it would be fun. I wanted a review as I would have liked a bit more sign of developing warmth and feeling towards Drusilla from Gervase as the book went on – and would have been a bit less gentlemanly in my handling of the culprit if I’d been the endangered Earl if I’d endured the Peninsula War and Waterloo..! Wondered if anyone else felt the same. Austen-wise, have just re-read ‘Mansfield Park’. So amazing it made my heart thud all through. Always envied a friend who lived in Marlborough Buildings, Bath, home of Mrs.Wallis ‘a mere pretty, silly, expensive, fashionable woman’ in ‘Persuasion’.